On November 21, 2018 Mr. Earl Wilbert Kelley of St. Paul, formerly of Mallaig, passed away at the age of 92 years. He is survived by 2 sons & 2 daughters, Wilbert (Betty) Kelley, Gladys (Francis) Bellerive, Deborah Prymych & Dale Kelley (Linda Kwiatkowski); son-in-law, Dave Prymych; 10 grandchildren, Bruce (Cheryl) Kelley, Tammy (Jared) Pigeon, Laura (Joe) Casurella, Lee (Victoria) Bellerive, Karen Prymych Dempster, Kelley Prymych, Martina née Kelley-Barker (Chad) Grose, Jody Nahirnak (Kevin), Dusty (Mel) Kwiatkowski & Craig Kwiatkowski (Teryl Enevoldsen); 20 great-grandchildren, Brooklynn, Cassidy & Allie Kelley, Jessica & Cohen Pigeon, Mia & Hayley Casurella, Jake, Hannah & Eva Bellerive, Cailyn, Wyatt & Shaughnessy Dempster, Emma, Ethan & Zoey Grose, Quinn & Courtney Nahirnak, Carly & Lexie Kwiatkowski; 2 sisters-in-law, Clara Kelley & Joyce Smith; 2 brothers-in-law, Jack Weinmeier & Clarence Smith; numerous nieces & nephews. 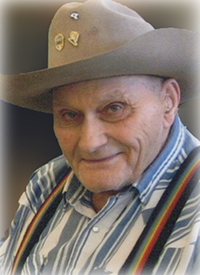 Earl was predeceased by his wife, Ada in 2016; parents, Patrick & Margie Kelley; sisters, Pearl Hodge & Lily Huxted; brother, Donald; 13 brothers-in-law, George Hodge, Harold Huxted, James Vance, Leslie Sloan, Stan Lister, Harry Smith, Bert Smith, Russell Smith, Almer Smith, Raymond Smith, Steve Hyshka, Arnold Erickson & James Stevens; 9 sisters-in-law, Blanche Smith, Myrtle Erickson, Almerette Lister, Shirley Weinmeier, Viola Stevens, Dorothy Belzil, Helen Stromsmoe, Agnes Smith & Anne Smith; numerous nieces, nephews & cousins. A Funeral Service will be held on Thursday, November 29 at 11:00 a.m. at Boscombe Hall, Boscombe. Pastor Owen Isaacson will be officiating, with interment in Willow Grove Cemetery, Owlseye. If desired, donations may be made to Haying in the 30s (Cancer Support Society) or The Gideons International in Canada c/o 5626 51 Street, St. Paul AB T0A 3A1. To send condolences online, please visit www.gracegardensfuneralchapel.com. Wilbert, Gladys and families, sorry to hear about your Dad. May you treasure all the memories you have of him..may he be at Peace now. Our thoughts and prayers are with you all during this difficult time. May God help you through it all. Our deepest condolences and sympathies. Our thoughts and prayers are with you .